Our goal is to demonstrate the building blocks that Scala developers use to create programs in a clear, succinct, and declarative manner. Working through the exercises in the book should take a few hours, after which you will know the basics of programming in Scala and have a feel of how the functional programming mindset works. 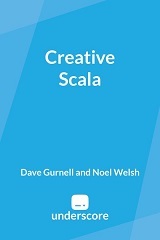 The exercises in Creative Scala are based on a functional graphics library called Doodle. Although Doodle is primarily designed to make programming fun and creative, it is based on universal concepts that apply to all well-designed software written in a functional style. One to two years’ experience with a programming language. No prior experience with Scala or functional programming is required.